What does the new workplace neighborhood look like as we shift from manufacturing to knowledge-based employment? The Grand Valley Metro Council in Michigan commissioned a study, “Workplace: Design for Dignity, Delight and Worth: Commerce Center Templates”, to define this in detail. What defines a workplace in the knowledge economy? See this diagram. – Firms are smaller: 55% of workers are in 100 or fewer person enterprises, 25% are in 100 to 500 person enterprises. This means smaller buildings are needed. – People have a ‘portfolio’ of skills and are more job transient, with more ‘craft’ workers, more women integrating child raising and work, more people working at home. – Regions are benefitting from economic clusters, which require face-to-face interaction for creative collaboration. – Employment buildings are shown in three dimensions. Those with red roofs have retail uses on the first floor. These are in an urban T5 or T6 zone. – The red area represents the neighborhood retail center with ‘main street’ building types in a T5 or T6. 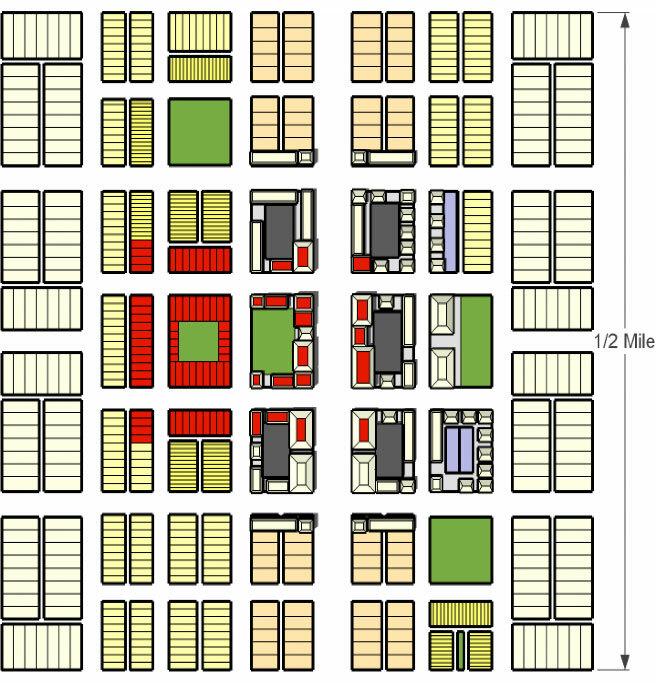 – The tan area represents multi-family housing in a T5 or T6 zone. 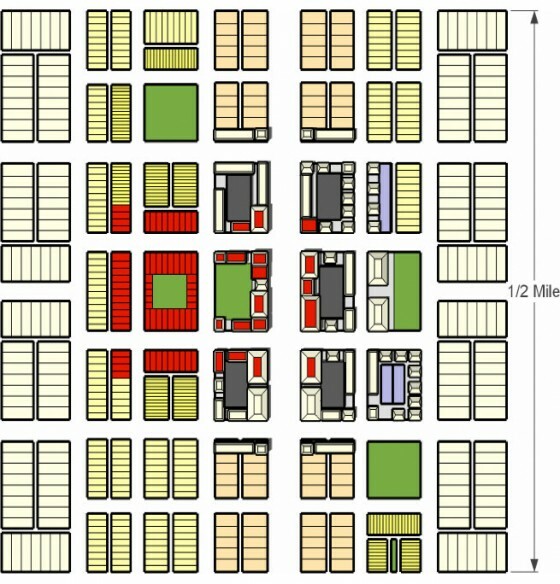 – The green areas are parks in the residential areas, and hardscape plazas in commercial areas. – The deepest yellow areas with the narrowest lots are townhouses/rowhouses in a T4 zone. – The darker yellow represents small cottage housing types in a T4 zone. These areas could also be townhouses/rowhouses for a more walkable, sustainable infrastructure. – The lightest yellow area on the very edges consists of single-family homes in the T3 zones, which could also be cottages. – Gray represents parking structures (completely hidden by buildings), blue represents surface parking. 2. Establish a form-based code, which ironically, not only allows workplace uses to change easily over time, but even if the market demands a switch to retail or residential uses as well. 3. Identify which districts and which sites on those districts are best suited for employment center investment. It’s economically, socially and environmentally beneficial not to concentrate employment in one area. 4. Master plan the site. This can either be a city or private sector investment, or combined. This is where crowdsourcing comes in. 5. Management. Handling development, parking, traffic and stormwater issues.